5:15 AM in the airport is the time of bleary eyed travelers. That’s what time my whirlwind journey to Thailand for my friend’s wedding started. In the next 40 hours, I would spend 35.5 hours in airplanes and airports. Denver to San Francisco was mostly spent sleeping. Except for the screeching child in the row in front of me. I’m forgiving of children crying on takeoff and landing because I’ve had times as an adult where the air pressure change was almost unbearable. This child felt that mid-flight was the optimal time for a tantrum. After a few sleepy hours in San Francisco, came the long haul to Beijing. Walking off the plane in Beijing was like opening the door to a freezer. Outside the temperature was -1C or 30F. Inside the airport wasn’t much warmer. In an effort to stay awake and warm, I spent most of my layover walking around and around the duty free shops. And just in case I wasn’t cold enough in the airport, our departure gate was actually a bus that takes the passengers to the plane where you walk across the tarmac. I was the last one on the first bus and the first one into the plane after the flock of passengers heading for Thailand made a mad dash through the freezing cold. Only once I sat down, ready to pass out from exhaustion, did I realize that the time for my flight to Bangkok had actually changed by almost 2 hours (24-hour time format and a sleepy brain are to blame). So instead of arriving at 11:45 PM we arrived at 1:45 AM. I slept. Heat and humidity were the ambassadors in Bangkok. 28C or 86F and a wall of humidity, even at 1:45 am. Following my well established routine after 11 trips to Thailand, I cleared immigration and customs, got a sim card for my smartphone (first time using a smartphone in Thailand instead of a simple travel phone), picked up a snack at 7-11 for the morning and went to get the shuttle to the hotel. Checking in at 3 AM, I begrudgingly requested a space in the 8 AM shuttle to return to the airport for the last of my flights. A shower, 3 hours of sleep, another 2.5 hours in an airport and a 1 hour flight, I finally arrived in Chiang Mai. 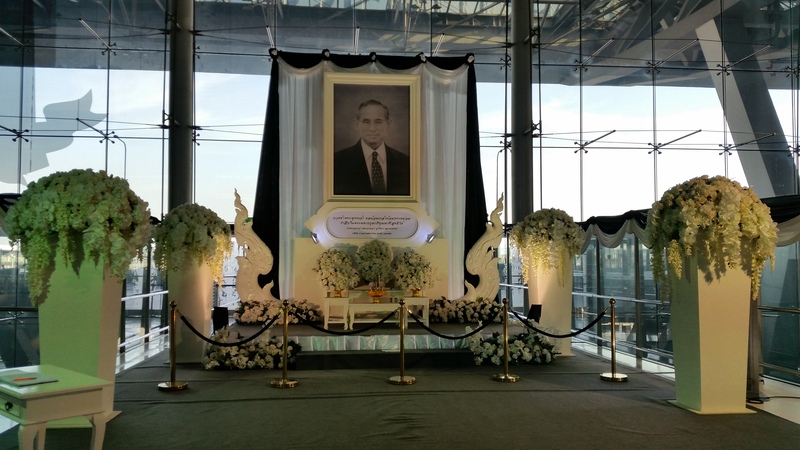 Memorial to the King at Suvarnbhumi Airport. In October, King Bhumibol Adulyadej passed away. At age 88, King Adulyadej was the longest reigning monarch, having reigned for 70 years. The King was deeply revered and honored by all of the Thai population, not just symbolically. He was their father, attaining something of a saint-like status for his support of the commoner and the advances he brought to their lives. For most of Thailand, King Adulyadej is the only king they have ever known. All of Thailand is a portrait of black and white in mourning. Government buildings, schools, temples, bridges and shops are graced with black and white bunting and black and white portraits of the King. As a show of respect and mourning, the people are dressed in black, or black and white. At the very least, a small black bow is pinned to their shirt or dress. Even the clothing displayed in big stores and night market stalls alike are predominately black and white. To see the love and honor bestowed upon the King is such a dichotomy from the current political situation in the United States. Visiting a destination multiple times becomes more about routine and less about adventure. I check in, get a motorbike, and go to the specific places I need to go to get the things that I know I need to get. Especially this trip where time is in short supply. My days of staying in the Old Town Chiang Mai are over. A few years ago CM Blue House, where I had stayed since my first trip in 2008, closed. Finding a new place is not necessarily easy. Not that there aren’t plenty of guesthouses and hotels to choose from. It’s about location and bed firmness. Easy to determine location on a website, impossible to determine bed firmness, even from reviews. Asian beds are a level of firmness ranging between marble floor to firm soil. Instead of having a motorbike delivered, it was better, cheaper and faster to walk to the old town. 15 minutes of uneven “sidewalks” down narrow sois (alleys) and I was at the old town. Seeing a new area on foot was actually a welcomed change. I found the Lanna Thai Massage Medical School and cataloged it as a place to potentially get a massage later. At the moment, I had more pressing activities to attend to. A distinct advantage to having a smartphone on a motorbike is the ability to pull over and access the Maps application. This feature alone has made my tried and true, heavily taped together map now obsolete. Having the Maps application does not negate the fact that I still missed at least one intended turn. A small 30 minute and several kilometer detour later and I finally found where I was going. While in Chiang Mai, seeing my good friends was a priority. Most of my friends here I have known going on 6 or 7 years. Life has changed for many of them. Of my closest friends in Thailand, only one is still working at working for Elephant Nature Park/Foundation. Wednesday night I got to see my sweet, wonderful friend Lek. Picking me up on her shiny new motorbike, a bigger model than anything I have ever seen her drive before, we went just a short distance down the road before turning into an alley nestled between two buildings. By alley, I mean a narrow spit of sidewalk just wide enough for a motorbike. No farang (foreigner) would have guessed there was a quaint restaurant perched on the banks of the Mae Ping river at the end of it. No farang would have probably even thought to turn there in the first place. We picked a table under a tree literally at the edge of the river bank. Any more erosion and the bench I was sitting on would no longer be at the table. The location was a perfect milieu with the lights of Chiang Mai reflecting off the surface of the river on the warm, clear evening. Lek ordered us a plentiful feast of som tam (papaya salad), tom yum goong (soup), kow pat mu (pork friend rice) and crispy fish with herbs. Over the course of the next hour we ate, discussed life and reminisced about the times we have had together. It was a beautiful evening and a great reminder of how rich my life is with friends around the world. Chet and I at dinner eating mugata. 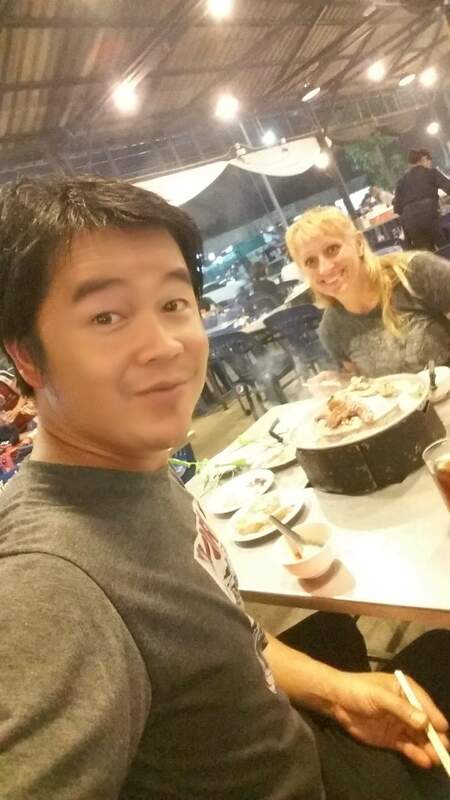 Thursday evening Chet and I went for mugata (literal translation is grilled pork). Mugata is the Thai version of a hot pot and a distant cousin of fondue. A metal pan looking like a small pointy hat surrounded by a moat is placed over a burner. The moat is filled with a light broth water. The pan is prepared by rendering large chunks of pork fat that keeps food from sticking and adds flavor to the broth as it runs down the pan. Then you cook your food, either grilling meats, or boiling vegetables, seafood or other food items. As the food is cooked, you eat it with a variety of dipping sauces. Chet introduced me to mugata several visits ago, so it always seems appropriate that it is our meal of choice. Having not seen Chet in over two years, it was great to see him again. I am happy for him and the opportunities he has had to grow in his work. He dreams of traveling and that dream is coming true. No trip to Thailand would be complete for me without at least a little time with elephants. Having been to Elephant Nature Park so many times and wanting to support different projects of the Elephant Nature Foundation, I opted to make new elephant friends going to the Hope for Elephant program. Hope for Elephant is a new day trip program where the Elephant Nature Foundation is working with several elephant camps to change how they use the elephants for tourism. The elephants that are now part of the project are free from saddles and giving rides and are subjected only to being fed, bathed and having thousands of pictures taken of them as they walk with the tourists around the hillside. As with all Elephant Nature Foundation projects, the mahouts (elephant caretakers) have relinquished their bull hooks and now use food for reward and control. Instead of waiting to be picked up by the van, I opted to go to the Elephant Nature Park office so I could say hello to a few more friends. Once they had gathered the others in the group, we traveled about 1.5 hours southwest of Chiang Mai to the village of Mae Wan. After 7 years of the same video about elephants in Thailand and the Elephant Nature Park project, I was ecstatic to see a new video and an entertaining animated video about elephant safety. So much has changed since my first day trip in 2008. Once in Mae Wan, we cleaned three baskets full of cucumbers and cut bananas off the stalk as offerings for the elephants we were about to meet. Then, piling in the back of the pickup truck, we headed into the hills to meet the elephants. A narrow road, only wide enough for one truck at a time, climbed up and down the hills. In one place the dirt road is replaced with two cement tracks, the solution to several rainy seasons washing away the road. Food is always the way to an elephant’s heart. Elephants eat a tenth of their weight in food each day, which means they are constantly eating something. Banana plants, trees, grass, whatever plant or vegetable available, they will eat it. Our introduction to the group was through feeding them. Three elephants belong in the group we visited. Fah Sai is the youngest at 7 years old, Kahm Mun is 25 and Moyo is 35. To make feeding the elephants on the project safer and controlled, they have built a small low fence that keeps the elephants at bay from the food and keeps humans from becoming the filling for an elephant sandwich. Walking with elephants is anything but aerobic activity. Much of the time along our relatively short and unchallenging trek, was spent watching the elephants roam and eat. Kahm Mun was the most active of the group in roaming and eating. Fah Sai often was Kahm Mun’s shadow, at least as far as eating went. Moyo stayed close to her mahout and his copious handfuls of food pellets. Along the way we had copious photo opportunities and time to interact with the elephants. Despite a collection of several thousand elephant photos, I still can’t help but take more pictures. You never know when you are going to capture THE shot. Plus, these are new elephants. Part of the experience was a mini cooking lesson in making som tam (papaya salad) for our lunch. After lunch we made an afternoon snack for the elephants, starting with pounding corn in a traditional hill tribe manner. The hill tribe people use a human-powered mill to pound the husks off the corn. That rice was added to cooked rice, tamarind, bananas, cooked pumpkin and salt, and mushed together by hand. I’ve said it before and I’ll say it again, bathing elephants never gets old no matter how many times I do it. Initially a bit on the cold side, the water was a refreshing break to the beating sun. 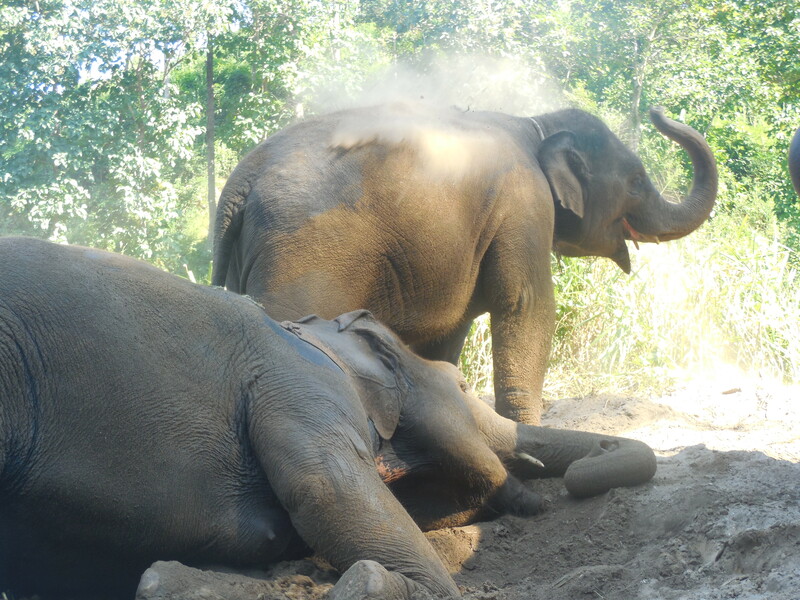 Kahm Mun and Fah Sai took to the water eagerly, lying down in the water and rolling in it to wash off the freshly applied mud. So beautiful to be able to get so close to these amazing and beautiful elephants. Fah Sai and Kahm Mun reapplying dirt after their bath. After their bath and a new application of mud and dirt, applied by rolling in it and using their trunks to coat their bodies, we got to feed them one more time. Seeing the transformation of the others in the group in just a few hours is so gratifying. One person even commented that she could see why I come back so many times. 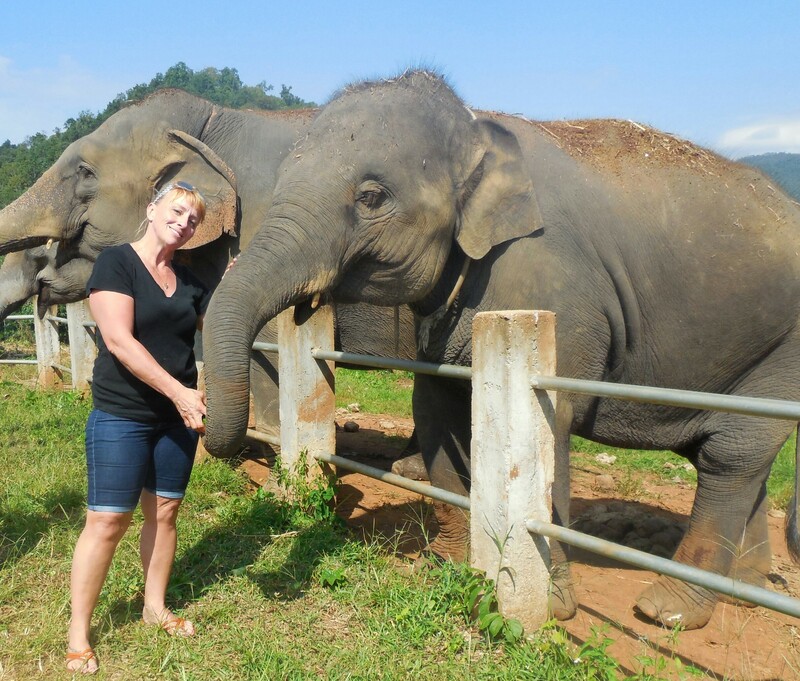 Eventually we said goodbye to our new elephant friends and headed back to Chiang Mai. Only 48 hours in Chiang Mai affords very little spare time to just wander. I did manage to sneak in a little bit though. On Nui’s recommendation I went to Wat Ket Karam, or the dog temple. Wat Ket Karam is located just down the street from the guesthouse and is frequented mostly by Thai, making it a quiet, reflective place to be. Still, I didn’t spend very long there. Just long enough to walk around the grounds and go into the main hall for a few minutes of reflection. 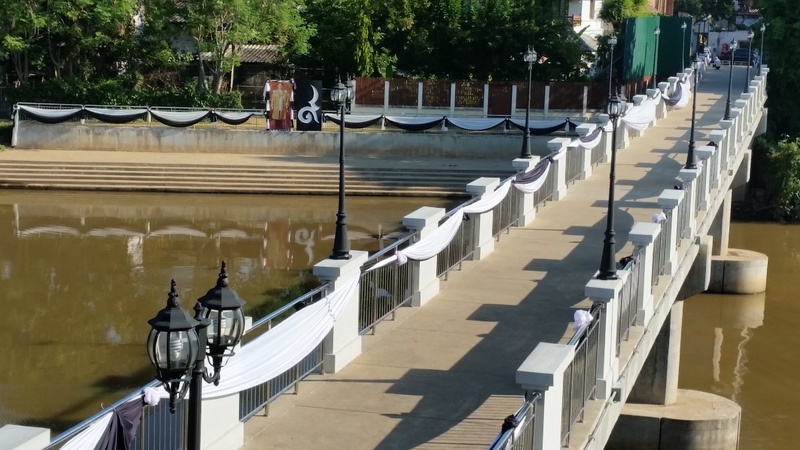 Worowot bridge with black and white bunting in honor of the King. No trip to Chiang Mai would be complete without a trip to my favorite temple, Wat Inthakhin. Wat Inthakhin I often refer to as “the temple in the middle of the road”, mostly because I can never remember the actual name. Nui provided the history for how this temple came to be located in the middle of a road. In the time of the Lanna kingdom, this wat (temple) was part of the royal complex. When the kingdom fell to the king in Bangkok, they wanted to debase the local people by destroying the royal palace and building their government buildings in that location. To add further insult to injury, they put a road through the royal temple. At the temple, I made an offering and got my fortune. Fortunes are made by taking a canister of sticks with numbers on them, and after a moment of prayer to ask what you want to know about, you shake the canister until the first stick falls out. The number on the stick is correlated to sheets of paper with your fortune (in Thai and English). My fortune was very good this time. Running on schedule, I had just enough time to return my motorbike and walk back to the guesthouse, stopping at the ATM and to get a long overdue massage. 60 minutes was not nearly long enough. Unfortunately that was all the time I had. The therapist was adept at addressing several key muscles that had been much abused. 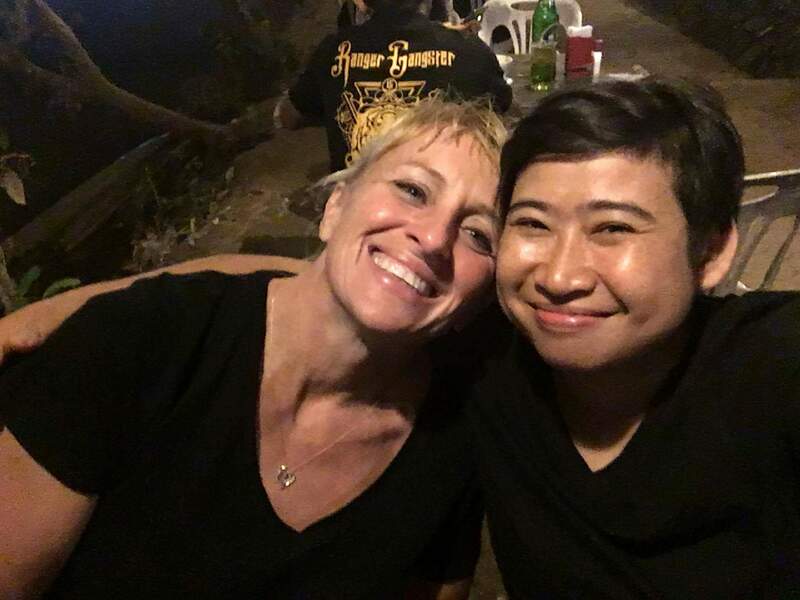 As I meandered the rest of the way back to the guesthouse in a state of post-massage bliss, I reflected on the benefits of getting off the motorbike every now and then. My quick tour of Chiang Mai came to an all too quick end and I headed off to Mae Sai by bus. Looking forward to seeing my friend Chai and attending his wedding.